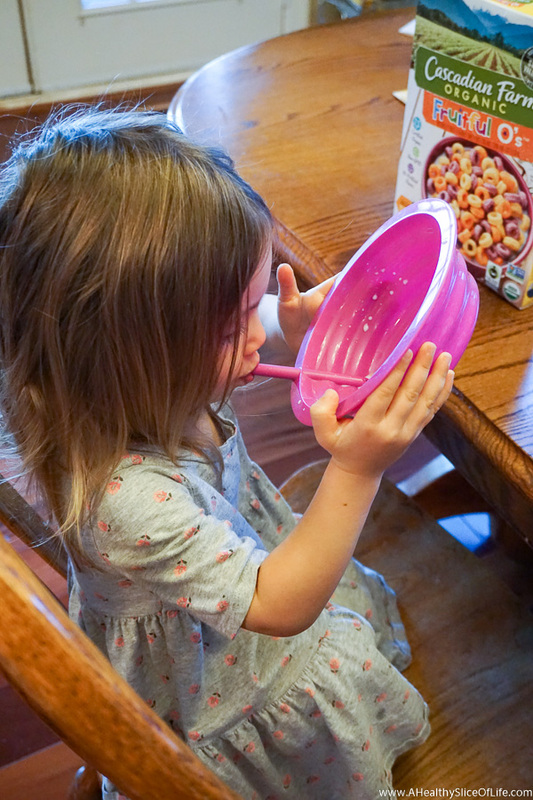 How I reversed my bad habits and got my toddler to actually be hungry at meal time and eat her dinner rather than snacking throughout the day. Kaitlyn (2 1/2 and all toddler) has always been on the more petite side in weight. Like many parents who go the baby led weaning route, I always wanted to make sure she was getting enough to eat. Because of this, I was a little more relaxed on the rules I followed for big sis Hailey. 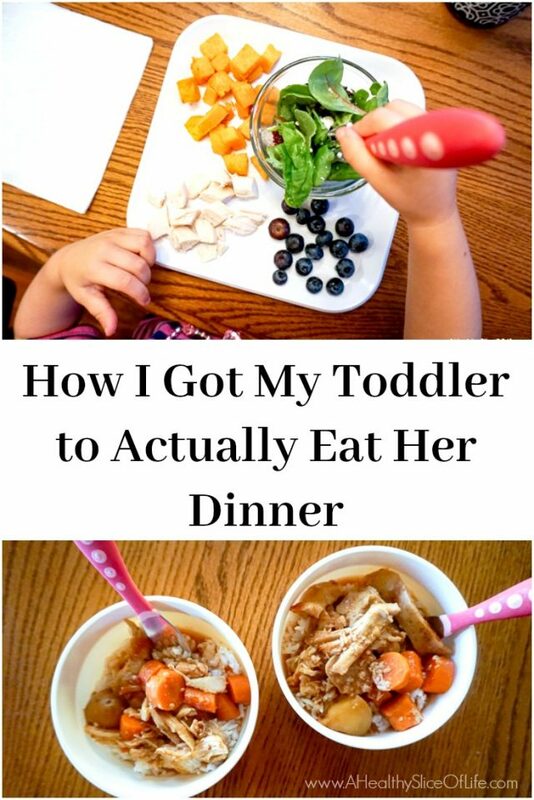 As time went by I realized it was getting to be a pain to get my toddler to eat dinner and other meals at their proper time. The bad habits we had fallen into meant she’d only eat a few bites at meal time, but would sometimes say she was hungry only a short time later. Now of course this isn’t a hard and fast rule. If they’ve been running on the playground for 3 hours and need something, of course I’ll let them have a snack, but regular snacking isn’t a thing around here. Not only does it save money on the grocery bill (snack specific foods can add up) but it means they are actually hungry at meal time. In fact, often 30 minutes before both kids start telling me they are hungry to which say GREAT, we are going to have dinner in 30 minutes. 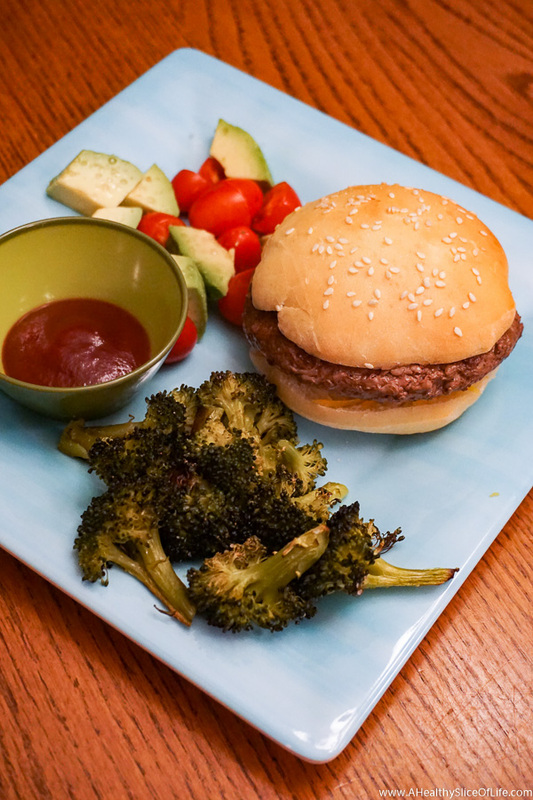 Hamburgers with homemade buns, roasted broccoli, and tomato avocado salad. If snacks are a regular thing in your house, try making snack foods more dull and meal food more exciting. It’s no wonder kids like snacks more; they are usually salty or sweet and come in fun crinkly packages. Switching to something more ordinary (cut up veggies, a banana, etc) for snacking can take the thrill out wanting to snack just for the fun food. Pretty basic, but if we are busy at the park or riding bikes in the driveway, the kiddos are distracted and not thinking of a snack. Plus, all that activity revs up their hunger so they are ready to eat at dinnertime! Marinated pork chop, roasted Brussels sprouts, and cantaloupe spheres. Give a 15 minutes heads up. I find all our activities in a day (leaving the house, taking a bath) go much smoother if I give Kaitlyn adequate time to prepare. I tell the girls that dinner will be in 15 minutes and ask them to set the table (which at 2 1/2 and 5 is just napkins and forks for all). 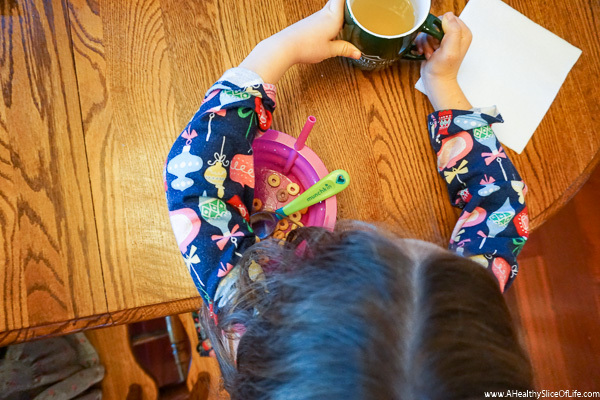 Giving my toddler time to start anticipating dinner means she is ready to climb in her chair at mealtime rather than being upset that I’m interrupting whatever activity she is engaged in. 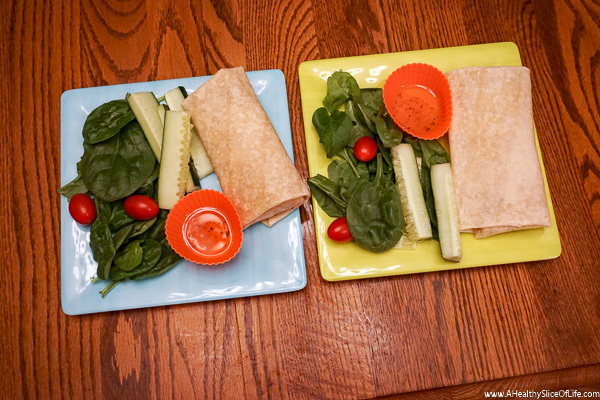 Dippable salad with pinto bean and cheese freezer burritos. Give the toddler a choice. 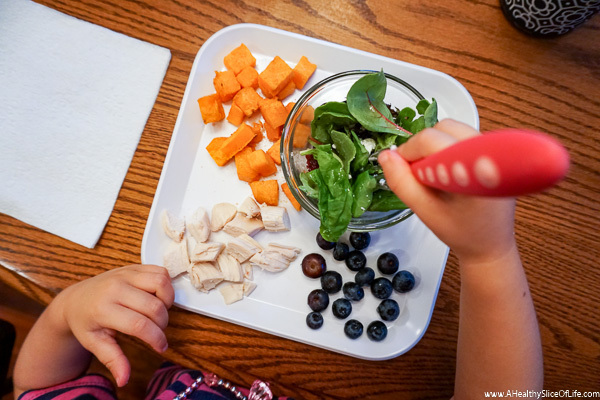 Not a choice in what to eat (I subscribe to the method of I chose what and when to eat and the toddler gets to choose if and how much), but a choice in other meal related matters can help her feel included in the process. Again, I start this 15 minutes before the meal because somehow choosing which cup or which spoon takes her forrrreeevvvveerrr. Kaitlyn gets really excited about forks and spoons for some reason and picking her own definitely helps mealtime run more smoothly. Peanut butter and jelly sandwich with grapes. On a “I want everything to be white” kind of day. I used to pile on the food hoping that seeing more would help her eat more, but I’ve actually found the opposite to work better. If I put a modest portion of each food on her plate, she seems to eat more and ask for more. I’ve heard some parents swear by serving family style and letting each child fix his or her own plate. Sounds like a good theory to me, but personally we haven’t reached that point yet. Rotisserie chicken, roasted butternut squash, mixed greens salad, and blueberries. Have an older sibling who is a good eater. This is cruel to put as a suggestion isn’t it? 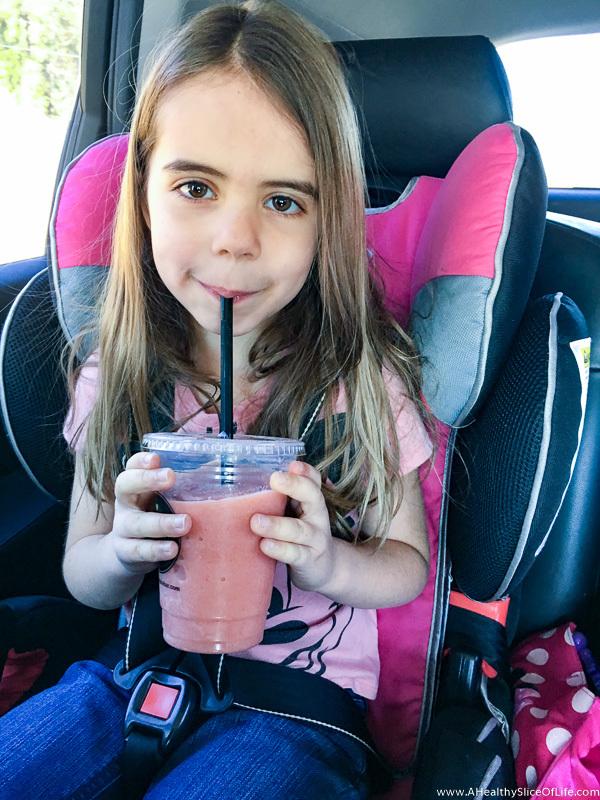 I wanted to include it though because I have no doubt that watching her older sister, who eats anything and everything, has encouraged Kaitlyn to be more adventurous in what she chooses to eat. It’s like she sees Hailey and I eat something and figure it has to be good. For example, kombucha. Hailey and I chug the stuff and Kaitlyn will sip it, make a terrible face, then go back and sip it again. It’s hilarious. Cascadian Farms Fruitful O’s with a “lemon drink” of warm water, lemon juice, ACV, and honey. Along the same lines as above, eating the same thing a the same time has helped Kaitlyn develop good habits and more adventurous taste buds. Slow cooker honey garlic chicken thighs over rice. Also see my post: We started eating dinner as a family and here is what changed. I’ve accepted that we are just at a point in our house where eating dinner takes a solid 45 minutes. It’s probably good for me to learn to eat more slowly (if I’m hungry I can just shovel it in), but I won’t pretend it’s not tedious. My toddler eats at a snail’s pace, so when I used to think she wasn’t eating much, it turned out she just wasn’t eating as quickly. Almond butter and honey sandwich, pistachios and raisins, grape tomatoes, and pita chips. Growing up my family always had meals together- in the dining room and with candles lit (I kid you not). It was so nice that it created an atmosphere to focus on only food and conversation. I’m slowly working on getting the same feel in place for our dinners. It’s a work in progress, but having no distractions (crafts on the table, etc) helps. My dad always had music in the background too, which I enjoyed, but I’ve found at age 2 that music doesn’t work yet because both Kaitlyn and Hailey are going to want to get up and twirl. 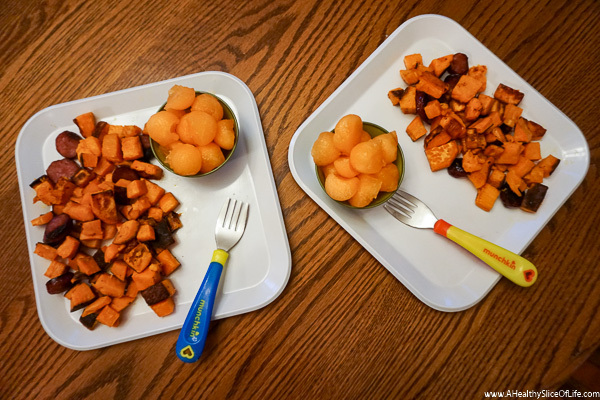 Roasted sausage and sweet potato cubes with cantaloupe. Near the top of the list of things that tickle me pink is when Kaitlyn or Hailey say more Brussels sprouts please! 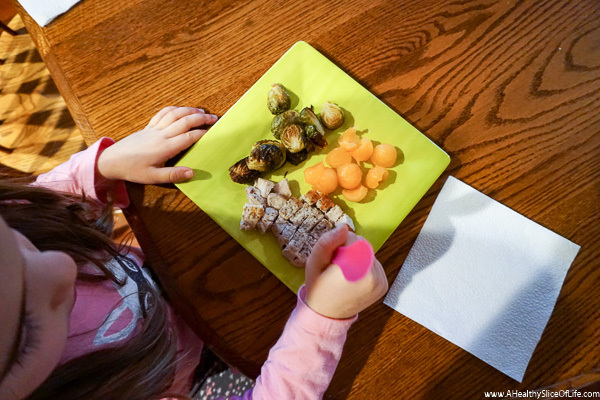 Never in my wildest dreams did I think that young kids would or could like Brussels sprouts or other seemingly “adult” food. 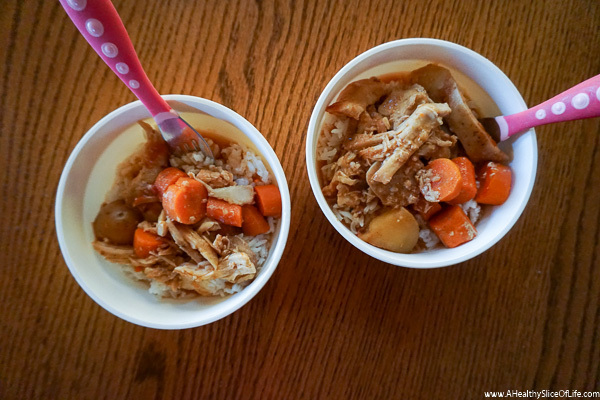 I’ve finally realized that beyond the challenge of cutting or chewing certain foods at the toddler age, there is no difference between kid food and adult food. We all like food that is flavorful! Honestly, it’s why I haven’t been able to do as many kid-specific recipes on here, because my kids typically just eat what I eat. I don’t expect my kids to eat boiled broccoli because boiled broccoli sounds really unappealing to me too. But adding a sprinkle of salt and garlic powder and roasting, means we all love the taste and gobble it up. What are your meal time struggles? What is your best meal time tip? Does anyone else have kids who want to spontaneously twirl between dinner bites? We only give fruit for snacks to my 3yo and he eats a ton at meals. We follow same meal time scheduke time as day care and it works well. Also you helped me with this but my son used to be picky and when he would say I don’t want this ..I would say ok you don’t have to but we are all done with dinner then and he started eating what I offer and no longer asks for something else.he eats what I offer. Thank u!!!! My 4 year old son has always been a great eater. He definitely goes through spurts but overall is good. He went through about a week of hardly eating dinner and then crying for a snack in the middle of the night. I talked to my Peditrician and she would make her kids finish the dinner for breakfast and that stopped it. I did that one time with him and it worked. I wouldn’t want spinach and mushroom enchiladas for breakfast either! 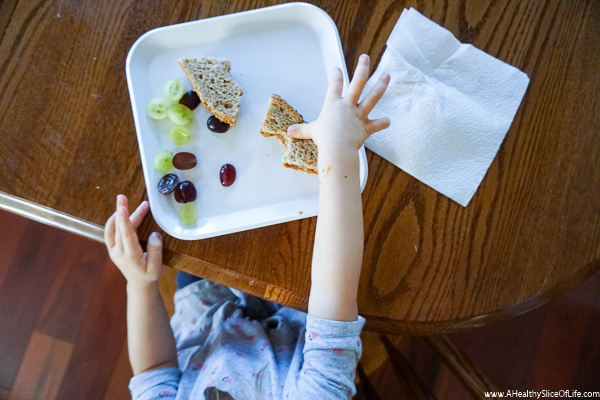 I don’t make my kids finish their plate, I want them to finish when they’re full but if they have one bite and say they’re done, I mention that I’ll wrap it up and bring it out for breakfast, that gets them eating. I definitely agree with the no snacking policy, as I too have found that even my “picky” eaters generally eat better and complain less about dinner when they are really hungry. That said my kids still lean more on the picky side. I try to ignore it, by continuing to make a variety of foods and put thing on their plate that I know they will likely not touch or eat very little of. It is frustrating though, because I end up wasting a lot of time preparing things that they will not eat. It drives me crazy because I am a very adventurous eater, love veggies and eat a wide variety of foods. They will eat a variety of flavors, but getting them to eat vegetable is a struggle and seems to be getting worse with every passing year. LOVE these tips!! I think I can also use some of these on my husband who is kind of a terrible example when it comes to mealtimes. Haha. Some of our biggest issues are trying to get our kids to try at least one bite, but also how to sit through the meal. I get that it’s hard for kids to sit still for too long, but I feel like dinner is the least relaxing thing right now. We had that same dinner atmosphere growing up too! I really like the trying it rule, where they have to try everything, but I won’t make them eat it. I won’t make her something else because I always include a like on the plate (you had another post about this) – for example, I will give her some applegate sausage, which is usually a miss but I want to keep offering, along with apple slices and sauteed peppers (two things she loves). Can you give some good dipable dressing options? I try to aim for no added sugar, but they are hard to find. I love the part about kids eating the same as adults. I don’t have children, but my parents always did that with my siblings and me and we never were picky eaters and always willing to try new things. The snacks can get out of hand so easily! Most of our snacks on hand are healthy (nuts, fresh fruit or cheese) so if my 3 year old asks for a snack prior to dinner I usually allow it since it buys me time to nurse the baby and finish dinner. Lately he has been snacking a ton from 4- 5:30 after we get home from daycare/ school but then still polishes off his plate at dinner. Other days even after eating a full dinner he is seemingly snacking up until bedtime, but again it is all nutritious whole food so I suppose he’s just hungry (can’t wait for the teenage years 🙂 ). We have always only served him what we are eating for dinner and this has worked well. His favorite foods are any kind of seafood (salmon, shrimp, trout, even smelt!). Yes, he has and sometimes still does want to get up from the table during dinner. It is a fine balance between granting independence and forcing table time. I really don’t want to make dinnertime and eating stressful or unpleasant, so my husband and I usually just continue eating and conversing and most often he’ll come back to the table on his own. I love a good 45- 60 minute dinner! That is what we did prior to kids so when we get a full dinner time in like that I cherish it. It happens more often now that our 10 month old is content eating with us. It seems like the eating recommendations have changed since we’ve had our second; we literally skipped any “baby food” or allergen concerns and basically just mash what we are eating for the baby (much easier, and gets baby used to different tastes at an early age). His first meals were eggplant parmesan and clam chowder, ha! My hope is that he will grow to be a good and adventurous eater like big brother (and mom and dad for that matter). If I have meal times with just me and the kids, if it does take a long time I read a story to them. They keep eating and it gives me something to do that still engages with them. I’m all for conversation at the dinner table but there does come a point when you’ve been sitting there for so long that you either need to get up or get out a story. Also, “Bringing up Bebe” is very fun and interesting read about an American mother raising kids in Paris. The “no snacking” policy also seems to be the general policy for French parents (according to the author). Great advice! My daughter is not a big snacker, but at 17 months old, I’m still struggling to get her to eat the same types of foods that my husband and I eat. She loves fruits and vegetables, especially if they’re pureed (in pouches) or in green smoothie form, but she’s not a huge fan of most vegetable textures if I put them on her plate, roasted or steamed. I’m hoping it’ll get better in time, because right now she still can’t really voice her opinions and won’t eat much if she’s distracted or tired. I’m pinning this for later! These are really great tips. My son is 15 months and the biggest lesson I’ve learned lately is that in his current phase, sometimes he’s just not hungry! So I offer him whatever we’re having and if he doesn’t want to eat, he does not have to. It seems to help. That and having a routine! I totally agree. 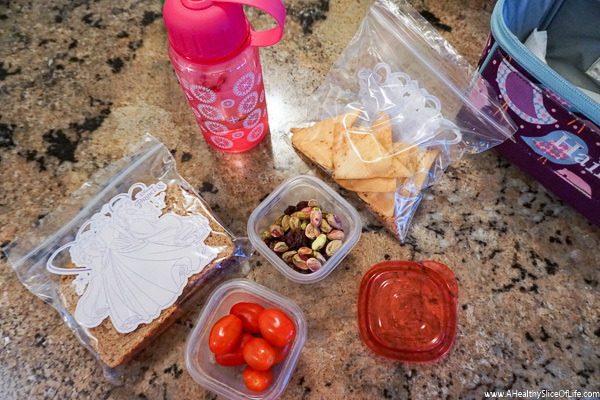 On the days I know we can eat lunch and dinner a little earlier, I skip my kids’ snacks and they eat meals so much better. Great advice! I agree with everything- now if only I could implement it. With a 7 month old I have been a bit in survival mode, but now I need to get cracking on this with my almost 3 year old. It is time, and thanks for the reminder! I was pretty good with giving my now 3 yo whatever we were eating but his extreme pickiness and the birth of our now 8 month old gave me an out to just give him whatever he wants so that we could just get through mealtimes. Now I am regretting that big time and trying to figure out how to get back to it. Eating has become soo frustrating 90% of the time. Baby will eat anything but toddler is a little nightmare! Kind of ironic because my husband and I are very healthful and adventurous eaters so I feel like we cursed ourselves with him! You’ve inspired me to try again tonight with putting whatever we have plus one thing he definitely likes.